"Japanese Army" redirects here. For other uses, see Japanese Army (disambiguation). The Japan Ground Self-Defense Force (陸上自衛隊, Rikujō Jieitai), JGSDF, also referred to as the Japanese Army, is the land-warfare branch of the Japan Self-Defense Forces and the de facto army of Japan. Created on July 1, 1954, it is the largest of the three services branches. New military guidelines, announced in December 2010, direct the Japan Self-Defense Forces away from their Cold War focus on the Soviet Union to a new focus on China, especially in respect of the dispute over the Senkaku Islands. The JGSDF operates under the command of the chief of the ground staff, based in the city of Ichigaya, Shinjuku, Tokyo. The present chief of staff is General Gorō Yuasa (湯浅悟郎). The JGSDF numbered around 150,000 soldiers in 2008. Japan accepted the Potsdam Declaration in 1945, and, in compliance with Article 9, the Imperial Japanese Army and Imperial Japanese Navy were dismantled. Both were replaced by the United States Armed Forces occupation force, which assumed responsibility for the external defense of Japan. Despite MacArthur and the SCAP's strict insistence on Japan having no military or self defence by constitution, Japanese prime minister Hitoshi Ashida amended article 9 of the constitution to allow the creation of military forces in Japan which would operate under the name of self-defence forces. The ground, naval and air self-defence forces all originate from this amendment, rendering the occupation's desire for a demilitarised Japan rather moot. Under the terms of the Treaty of Mutual Cooperation and Security between the United States and Japan, United States forces stationed in Japan were to deal with external aggression against Japan while Japanese forces, both ground and maritime, would deal with internal threats and natural disasters. Accordingly, in mid-1952, the National Police Reserve (formed in 1950) was expanded to 110,000 men and named the National Safety Forces. In 1952 the National Police Reserve was renamed as National Safety Force. Japan continued to improve its defensive capabilities. 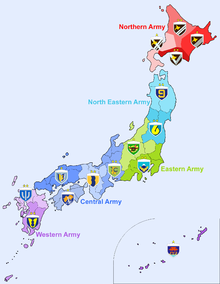 On July 1, 1954, the National Security Board was reorganized as the Defense Agency, and the National Security Force was reorganized afterwards as the Japan Ground Self-Defense Force (Army), the Japan Maritime Self-Defense Force (Navy) and the Japan Air Self-Defense Force (Air force), with General Keizō Hayashi appointed as the first Chairman of Joint Staff Council—professional head of the three branches. The enabling legislation for this was the 1954 Self-Defense Forces Act [Act No. 165 of 1954]. For a long period, the Japan Ground Self-Defense Force possessed a dubious ability to hold off a Soviet invasion of Hokkaido. Zbigniew Brzezinski observed in 1972 that it seemed optimized to fight "a Soviet invasion conducted on American patterns of a quarter of a century ago." While the force is now an efficient army of around 150,000, its apparent importance had, until recently, seemingly declined with the end of the Cold War, and attempts to reorient the forces as a whole to new post Cold War missions have been tangled in a series of internal political disputes. On March 27, 2004, the Japan Defense Agency activated the Special Operations Group with the mandate under the JGSDF as its Counter-terrorist unit. In 2015, the Japanese Diet passes a law that allowed for the reinterpretation of Article 9 of the constitution. JSDF personnel train with the American forces in amphibious assault units designed to take outlying islands. Japan activated its first marine unit since World War II on April 7, 2018. The marines of the Amphibious Rapid Deployment Brigade are trained to counter invaders from occupying Japanese islands along the edge of the East China Sea. JGSDF soldiers from the 22nd Infantry Regiment train with U.S. Army soldiers in a bilateral exercise at Fort Lewis' Leschi Town in October 2008. JGSDF soldiers and U.S. soldiers participate in the Orient Shield 2017 opening ceremony at Camp Shin Yokotsuka, Sept. 11, 2017. In 1989, basic training for lower-secondary and upper-secondary academy graduates began in the training brigade and lasted approximately three months. Specialized enlisted and non-commissioned officer (NCO) candidate courses were available in branch schools and qualified NCOs could enter an eight-to-twelve-week officer candidate program. Senior NCOs and graduates of an eighty-week NCO pilot course were eligible to enter officer candidate schools, as were graduates of the National Defense Academy at Yokosuka and graduates of all four-year universities. Advanced technical, flight, medical and command and staff officer courses were also run by the JGSDF. Like the maritime and air forces, the JGSDF ran a youth cadet program offering technical training to lower-secondary school graduates below military age in return for a promise of enlistment. Because of population density and urbanization on the Japanese islands, only limited areas are available for large-scale training, and, even in these areas, noise restrictions are extensive. The JGSDF has adapted to these conditions by conducting command post exercises, map manoeuvres, investing in simulators and other training programs, as well as conducting live fire exercises overseas at locations such as the Yakima Training Center in the United States. The JGSDF has two reserve components: the rapid-reaction reserve component (即応予備自衛官制度) and the main reserve component (一般予備自衛官制度). Members of the rapid-reaction component train 30 days a year. Members of the main reserve train five days a year. As of December 2007, there were 8,425 members of the rapid-reaction reserve component and 22,404 members of the main reserve component. Ground Component Command (陸上総隊, Rikujō-Sōtai) is headquartered in Asaka, Saitama Prefecture. It was reorganized from the Central Readiness Force on March 27, 2018. In wartime, it would take command of two to five armies. 7th Division (7th Armored division), in Chitose. 12th Brigade (Air Assault), at Camp Soumagahara in Shintō, responsible for the defense of Gunma, Nagano, Niigata and Tochigi prefectures. 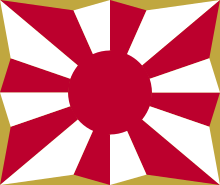 13th Brigade, in Kaita, responsible for the defense of the Chūgoku region. 14th Brigade, in Zentsūji, responsible for the defense of Shikoku. JGSDF divisions and brigades are combined arms units with infantry, armored, and artillery units, combat support units and logistical support units. They are regionally independent and permanent entities. The divisions strength varies from 6,000 to 9,000 personnel. The brigades are smaller with 3,000 to 4,000 personnel. JGSDF Chief of Staff Eiji Kimizuka, speaks with a U.S. Marine officer aboard the USS Essex (LHD-2), in March 2011. ^ a b "Japan Self-Defense Force | Defending Japan". Defendingjapan.wordpress.com. Archived from the original on 2015-02-16. Retrieved 2014-08-03. ^ Fumiko Sasaki (26 July 2012). Nationalism, Political Realism and Democracy in Japan: The thought of Masao Maruyama. Routledge. p. 136. ISBN 978-1-136-31378-3. Retrieved 24 May 2013. ^ "An article in The Economist dated Nov 20, 2017". Archived from the original on November 21, 2017. Retrieved November 21, 2017. Wikimedia Commons has media related to Japan Ground Self-Defense Force.